By buying this product you can collect up to 230 loyalty points. Your cart will total 230 loyalty points that can be converted into a voucher of € 46,00. The core of the Lyra is a sophisticated DSP engine. This processing engine involves the latest developments in DSP technology by Texas Instruments. An intense cooperation between T.I. and D&R has resulted in a digital audio mixer offering tremendous DSP power and a superb sonic quality. 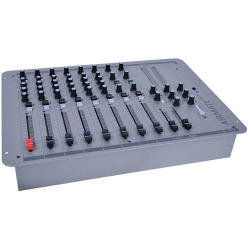 Although the Lyra is a digital console, it is operated with the same comfort as a conventional analog production mixer. No fundamental concessions have been made towards reliability, high speed controller-response and system stability. 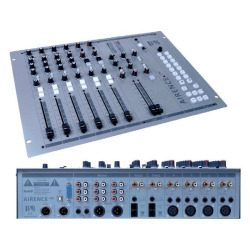 Over 18 inputs (7x digital, 7x analog, 4x mic inputs) are connected to a digital cross-point router to accept various formats of audio. This router actually is an integrated programmable patch-bay allowing you to send any of the input signals to any desired processing channels of the DSP?s. These processing channels consist out of a three band parametric Eq-section and dynamics control application. The signal output by the DSP channel can be routed to main stereo busses. Every main buss is stereo and has dedicated analog outputs, but the bus signals can also be routed to a digital output as well. Monitoring functions are analog making interfacing with the outside world very simple and easy to understand. 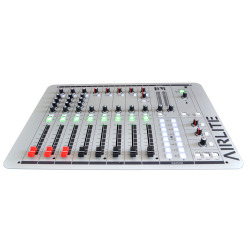 The Lyra has four processing channels with 100m faders with large illuminated On and Cue switches an a rotary encoder for multiple functions. A LCD per channel shows input selections and many other functions. 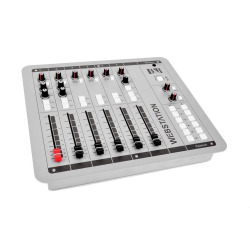 In the right hand section of the console are dedicated instant access functions for Source selection, Gain, EQ on/off, Dynamics on/off, Aux, Pan, Program and Sub selection. 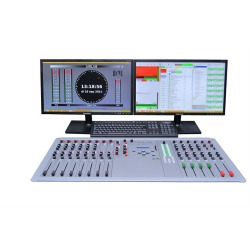 The analog master section with 16 segment led bars and source select switches makes interfacing very easy with all sorts of monitoring devices. A CobraNet option is available for integration within our network solution to share more sources. An Ethernet connector is available for remote control via TCP/IP protocol.